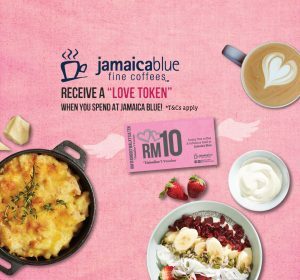 This Valentine’s Day, Jamaica Blue is spreading the love by giving out RM10 “Love Token” when you spend at any of our outlets with no minimum spending required! There’s a twist to this! Don’t forget to bring your loved ones! Valid for dine-in only, at all Jamaica Blue Malaysia Outlets. Only the original Valentine’s Voucher will be accepted, and must present upon ordering. The Valentine’s Voucher redemption is limited to maximum of 2 vouchers per transaction, per table. Voucher is non-exchangeable nor redeemable for cash. Value of voucher is not replaceable if lost or damaged. Not valid with other on-going promotions, privileges, vouchers, set meals or offers. All prices are subject to 6% of Sales & Service Tax. The management reserves the rights to amend the terms & conditions without prior notice. This giveaway is on first-come-first served basis or while stocks last. Spread the love, and have a lovely Valentine’s with your loved ones!